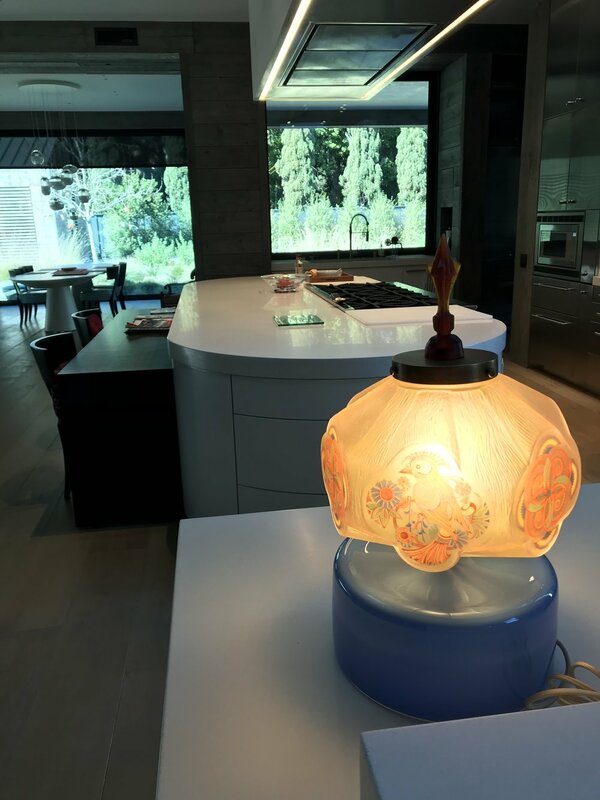 My client inherited a piece of vintage glass from her family that hung in her childhood home as a pendant light. Her long personal history with this object added an extra layer of emotional accountability to my design process. 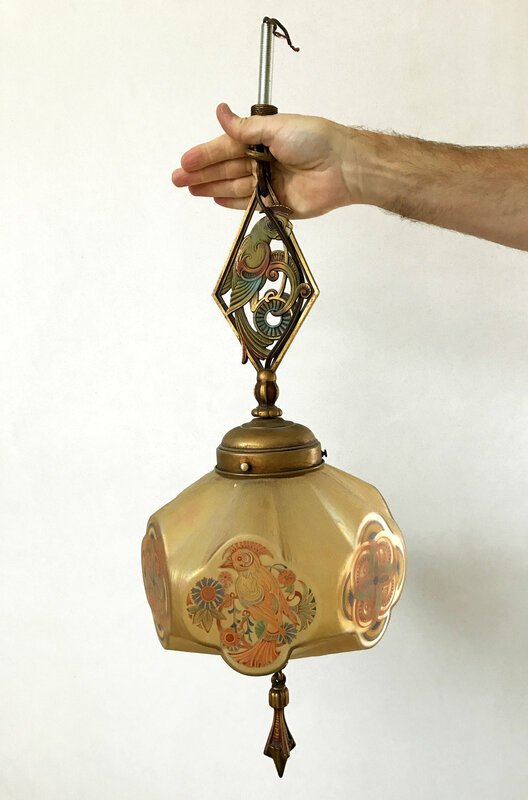 When she wanted me to re-envision this family heirloom as a contemporary lamp that would complement her current home, I was slightly hesitant, but up for the challenge. Every detail of the original object felt antique and unlike anything I’d ever worked with or designed. The assembly had four parts. A metal top piece that loosely represented a birdcage shaped like a diamond, with a faintly painted parrot sitting inside. A traditional-looking rounded tiered cap held the glass in place. A mold-blown, fumed, and enamel decorated glass piece was a recognizable relic from another era. And, finally, there was an Art Deco metal dangle on the bottom. My process for tackling complex spaces and design challenges usually starts with drawing. For this piece, my drawings required physically deconstructing the assembly to sketch it and measuring the individual components. This gave me intimate knowledge of the textures, colors, imagery, and stylistic details of the original. From this investigation, my design direction started to emerge. The art deco dangle that originally hung from the bottom of the pendant seemed like a natural finial form. Flipping this component upside down and putting it on the top of the new lamp also lent itself to a material transformation. I decided to cast the metal dangle in transparent ruby colored glass to bring a luminous quality to the top of the lamp. 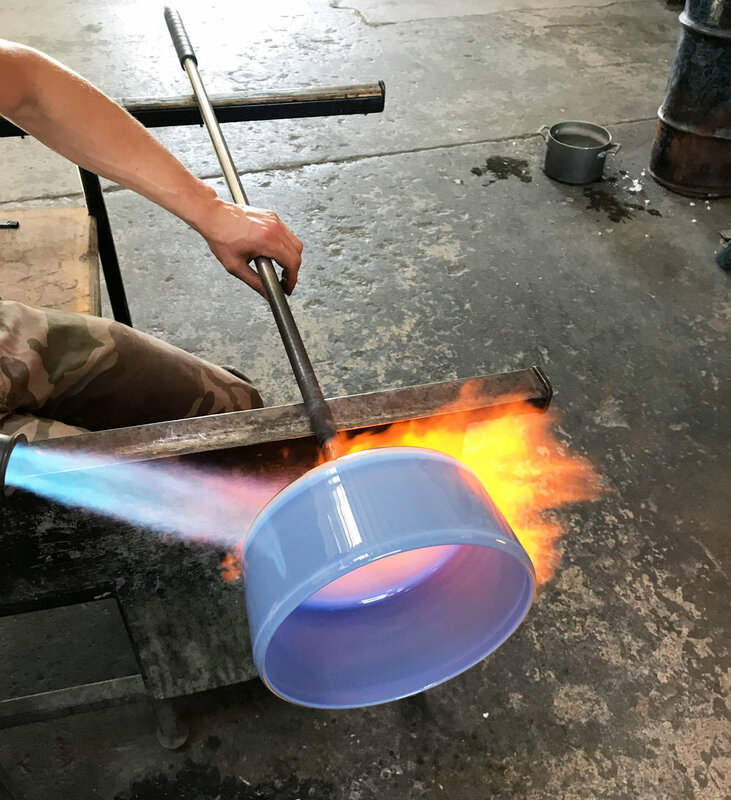 We arrived at the color through extensive color matching exercises comparing raw casting glass with the green, blue, burnt sienna, and gold, which were all colors present in the lamp. This translucent element glows in the natural light in the space, which tied this piece thematically to the others I created for the home. 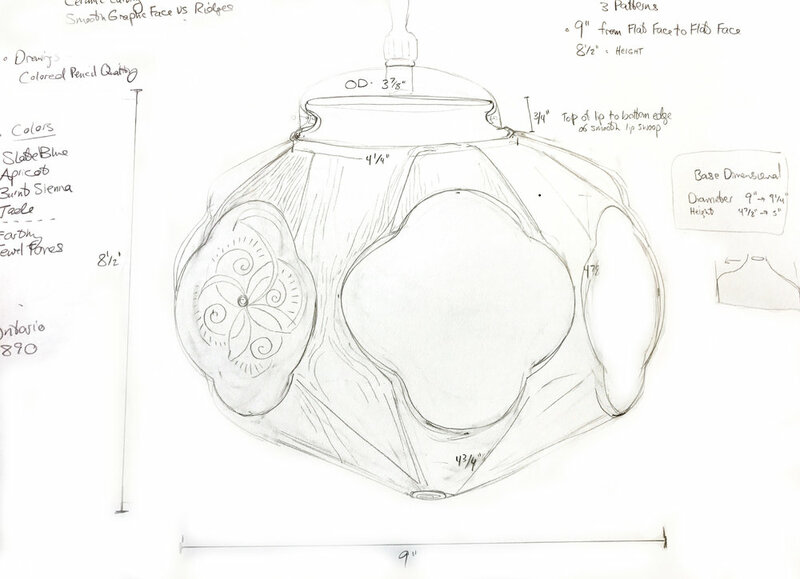 Working with the original Parrot Glass and the ruby dangle as the finial, a tabletop lamp design started to take shape. I proposed a straight-sided, pale blue, blown cylinder as the base of the lamp. Luckily, there is a glass color available that is a perfect match for the blue in the enamel drawing on the Parrot Glass. Beyond the color, the size and the proportion of the base in relation to the Parrot Glass would define the light. I created several paper prototypes representing various size and proportion options for the cylindrical base. I held these up to the Parrot Glass to get my clients’ reactions. We reviewed all the options and collectively chose a winner. Starting with all the colors of the rainbow as cord color options, we decided to de-emphasize the cord element by choosing a neutral color. This thinking also carried over to the selection of the specific metal tint we would use for the cap and metal connection between the blown glass base and the antique parrot glass.